Merry Christmas to Fort Wayne and surrounding communities! 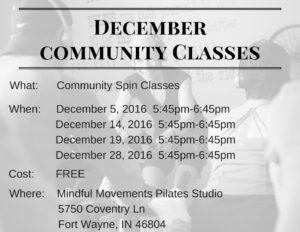 During December, Mindful Movements is offering free community classes! Join us for support, instruction, and a fun Spinning workout and stay fit for the holidays. To sign up for class on December 5th, click here. Sign up for December 14th by clicking here. Sign up for December 19th by clicking here. Sign up for December 28th by clicking here. Most of us have heard of foam rollers and typically think of forcefully rolling out our muscles on a hard piece of plastic. MELT foam rollers are completely different. The movements aren’t forceful or painful and in fact, MELT focuses on promoting overall health by improving cell proliferation. So, instead of focusing on increasing the blood flow to major muscle groups like traditional foam rollers have done, MELT uniquely rejuvenates each cell by relieving stuck stress and increasing hydration to the collagen matrix. Sounds technical? Come join us on November 12 at Powers of One Yoga Studio as we learn the roller techniques and explain how MELT works. Click HERE to be taken to our event page on Facebook and HERE to purchase your tickets. For further information about the difference of MELT rollers vs. traditional rollers, visit HERE as Sue Hitzmann, creator of MELT, describes the science behind MELT’s roller method!